This is a sponsored post on behalf of GlassesUSA.com. I have received compensation for this post, however, all opinions are mine. I was in fourth grade when I started wearing eyeglasses. It wasn't cool. I remember picking out these pinkish plastic cat eye frames. They were horrible. They definitely didn't suit my face. Then came the overly large plastic frames on middle school. *shudder* I paired them with a perm. By the time high school rolled around, I discovered small wire frames and spent a brief time in contacts. Contacts BTW were way too much work and I ditched them shortly after I got married. Sometime after B was born, I discovered fashionable frames. . .frames that actually looked good on me and were stylish. I think that's when I fell in love with glasses as an accessory. It wasn't really affordable to collect an assortment of frames to go with different outfits or moods. With my prescription, there was happiness in just finding something non-ugly that could hold my lenses. Then came the internet and all the sites with cheap eyeglasses! I love to buy glasses online. My little girls love my glasses. You are supposed to store glasses in the cases but that doesn't always work with little helpers. 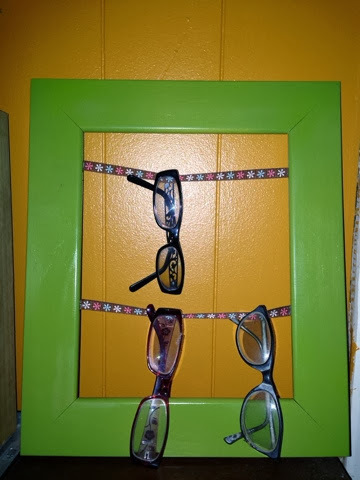 I needed a way to keep the glasses up and out of their reach, yet within mine. Decorative and functional: An old frame, some paint and ribbon! And the glasses get to hang out ... I'm thinking I might need to add some more color to my glasses! I'm really pleased with my latest pair from GlassesUSA.com. Honestly, out of all the companies I've tried, I've been most impressed with their ordering process, shipping and quality. And I'm not just saying that because they offered me a credit to try their services for discount glasses. First, super impressed with the Virtual Mirror feature. I liked being able to scroll through all the glasses and see how they looked on my face without clicking each pair. Second, it was nice to get emails to know where in the process my glasses order was. From the time I ordered to receiving the glasses was just under two weeks. Third, quality. These aren't cheap plastic frames. There is a definite weight to the glasses. This isn't a bad thing. Some plastic frames from other online companies don't have weight to them... And tend to snap or crack. It goes back to the old saying of "You get what you pay for!" There is a 100 percent satisfaction guarantee and a 110 percent low price guarantee. Definitely satisfied with the price and quality. 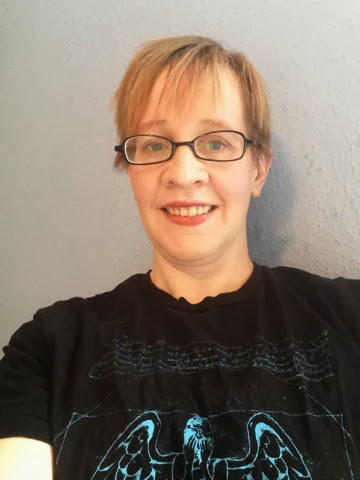 GlassesUSA wants you to try for yourself and is offering my readers a discount! Use the code BLOG10 for 10 percent off your order. There is even a refer a friend program where you can get a $30 credit towards your next pair of glasses. They definitely suit you :) How clever is the virtual mirror! ?Good idea indeed!